The Rayleigh Cable Managed Wave Office Desks are available in a choice of 5 heat resistant.. The Rayleigh Cable Management Corner Office Desks are available in a choice of 5 heat resi.. The Rayleigh Desk Set is made from 1x Straight Office Desk with a Silver Cantilever Frame and a.. The Rayleigh Desk Set is made from 1x Corner Desk with a Panel End Frame and 1x 2 or 3 Drawer F.. The Rayleigh Desk Set is made from 1x Corner Desk with a Silver Cantilever Frame and 1x 2 or 3 .. 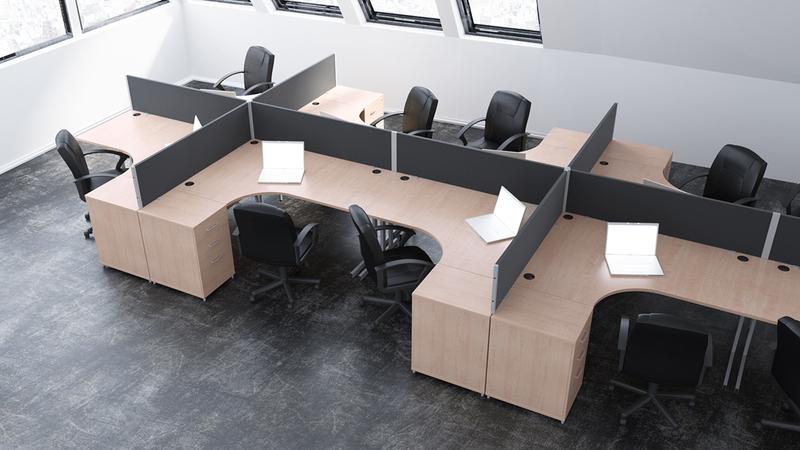 The Rayleigh Desk Set is made from 1x Straight Office Desk with Colour Matching Panel End Legs ..
25mm tops Wire management panel Heat resistant melamine finish 18mm modesty panel 2mm protective ABS.. The Rayleigh Desk Set is made from 1x Corner Desk and 1x 3 Drawer, Desk High Pedestal. The Impu.. The Rayleigh Desk Set is made from 1x Corner Desk with a cable-managed frame and 1x 3 Drawer, D.. The Rayleigh Box Frame Semi Circle Table is ideal for meeting rooms and boardrooms. it is available .. The Rayleigh Boardroom and Meeting room tables are available in 2 width options (1800mm wide and 240.. The Rayleigh Boardroom Tables are available in 2 width options (1800mm or 2400mm) and are 1200mm dee.. FITS ALL RAYLEIGH STRAIGHT, WAVE AND CORNERS DESKS, EXCEPT FROM 600MM DEEP DESKS.Lockable DrawersFul.. The Rayleigh Mobile Pedestals are ideal for use in both the home and commercial office. They a.. The Rayleigh Under Desk Pedestals are ideal for use in both the home and commercial office. The.. The Rayleigh Desk High Pedestals are ideal for use in both the home and commercial office. The..
Rayleigh is our stunning range of office desks, cupboards, filing cabinets, pedestals and mor.. The Rayleigh Desktop Screen is our desktop screen perfect for dividing desks as well as adding priva..
Rayleigh is our stunning range of office desks, cupboards,filing cabinets, pedestals and more in a choice of four colours; walnut, beech,white or maple. The desks come with steel legs and the pedestals / cabinets areall lockable with 100% extensions. The furniture features 25mm tops, high density heat resistant mfc panels and 2mm protective edging throughout. All legs have floor levelers built in to ensure you can line the furniture up. Designed to be cost effective, good looking and practical without losing any features along the way. Rayleigh fixed pedestalFITS ALL RAYLEIGH STRAIGHT. WAVE AND CORNERS DESKS, EXCEPT FROM 600MM DEEP DE.. Desk and pedestal bundleCantilever Desk Legs Heat Resistant Melamine Resistant Height Adju..